(AINA) -- The Arabic language Assyrian (also known as Chaldnen and Syriac) website ankawa.com is reporting that 1 priest and 3 deacons were gunned down in Mosul as they left the Church after having finished Sunday Mass. Fr. Ragheed Ganni, Deacon Basman Joseph, Deacon Bassam and Deacon Ghassan of the Holy Spirit Church were killed around 7:30 P.M. by a hale of bullets from a group of gunmen. Their car was booby trapped to prevent the recovery of the bodies. According to the AFP, the four had finished mass at 7.30 PM and were driving away in the priest's car when they were intercepted, about 100 meters from the church, by a car; four men got out and shot them. Fr. 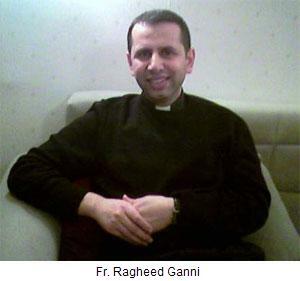 Ganni was born in Mosul in 1972; he held a Bachelor of Science in civil engineering from the University of Mosul (1993). He studied in Rome from 1996 to 2003 where he Obtained a Masters in Divinity (Moscone Theology).